These potatoes are my mom’s specialty and one of James’ favourite things to eat–which is to say they are the thing with which my mom spoils James. They make a regular appearance at my house so I’ve never had to learn to make them. 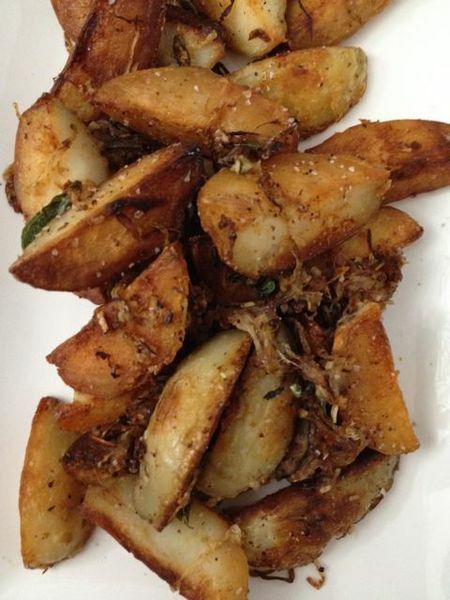 When I finally did (because I was making a whole biryani spread one night and these potatoes are an absolute must for that), I was surprised at how easy they were to make. They are so crispy, I equated them with painstaking frying/attention/babying. In fact, they mostly cook themselves. You simply pre-boil the potatoes, fry some onions and seasoning for a final mix post-potato fry, and just remember one thing–don’t overcrowd the pan. As long each side of potato wedge gets a couple of minutes of quality time with a hot, oiled pan, you can be guaranteed potatoes as more crisp and flavourful than any you may have had before. Big promises, I know, but this recipe won’t disspoint. Put the potatoes in a large pot, cold water, add a generous pinch of salt, cover and boil until the potatoes are cooked to fork-tender. Remove, drain and when they are cool enough to touch, peel skin off potatoes. Cut them into 6 wedges lengthwise and set aside. Heat oil in wide non-stick skillet over medium-high heat. Add the curry leaves and fry for 30 seconds. Add the onions and lower the heat to medium. Sprinkle with salt and stir-fry until golden brown. Add the garlic, the serrano and chili flakes and stir-fry for 1 minute more. Remove with a slotted spoon, trying to leave as much oil behind in the pan as possible and set aside. Add generous sprinkling of salt evenly over the oiled, empty skillet. Add the potatoes in a single layer (work in batches if you have to) and leave without stirring to fry until golden on one side. Turn and repeat until fried to golden on all sides. Add the onion mixture back to the pan and mix well. Taste and adjust seasoning if needed.